In fiscal year 2015-2016, Emory Healthcare provided $72.3 million in charity care. "Charity care" includes indigent care for patients with no health insurance, not even Medicaid or Medicare, and no resources of their own. It also includes catastrophic care for patients who may have some coverage but for whom health care bills are so large relative to their financial situation that paying them would be permanently life-shattering. The box below details the charity care provided at individual Emory Healthcare facilities. 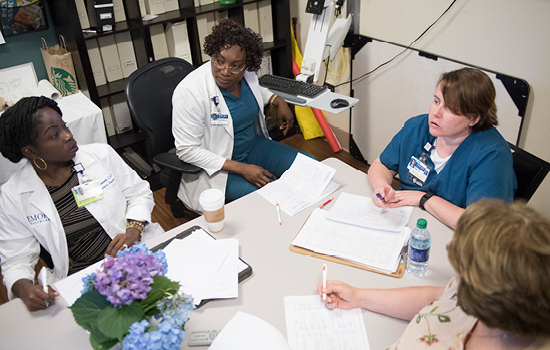 Included elsewhere in this book are amounts of uncompensated care provided by Emory physicians who practice at Grady Memorial Hospital and at other hospitals and clinics where many volunteer during their free time. The $72.3 million total above represents the unreimbursed cost of providing charity care, based on actual expenses to Emory Healthcare. Cost reporting is standard for calculating charity care totals, as required by the Internal Revenue Service and advocated by the Centers for Medicare and Medicaid Services and the Catholic Health Association.